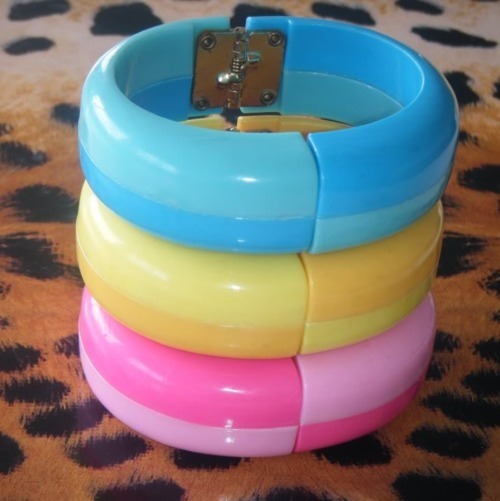 I have a predilection for vintage clampers, those hinged bracelets that rely on the tension from the hinge to stay closed (although some have clasps as well). Vintage clampers can be found in just about every material imaginable: Bakelite, Lucite, plastic, silvertone, enamel, celluloid. Some are abstract, Art Deco, or Art Nouveau, some even come in animal shapes. Some are flashy and rhinestone encrusted and some are mod and minimalist. I love them all. As one can imagine, there are hundreds of vintage clampers on eBay and etsy, but we saved you the trouble of wading through all the junk. 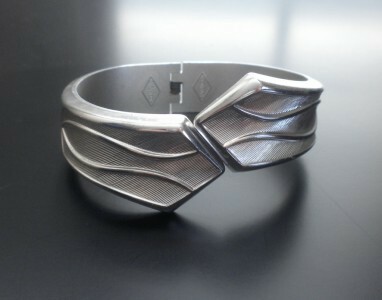 Below are some of the best clamper bracelets we found this week. Click on each image to see the listing. 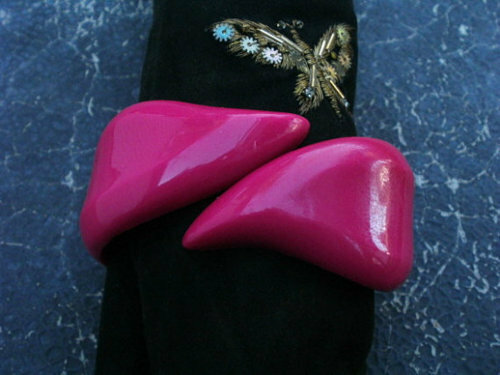 Vintage 1950s pink Lucite clamper from griffincat on etsy. $6.99. 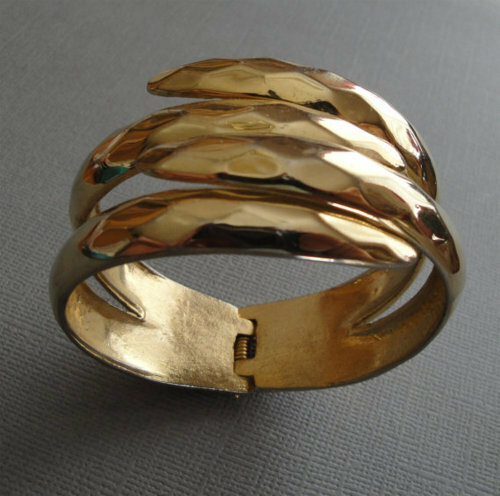 One of my favorite vintage jewelry makers. 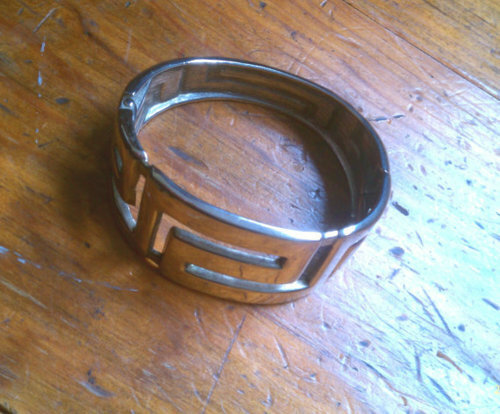 A very collectible, signed Sarah Coventry silvertone clamper bracelet. Current bid on eBay $9.99. 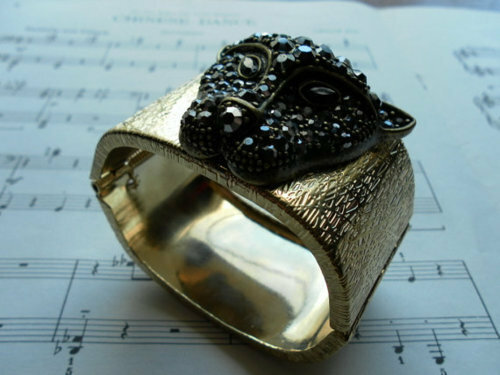 Huge rhinestone encrusted leopard head clamper from TheVintageAngel on etsy. $54.40. 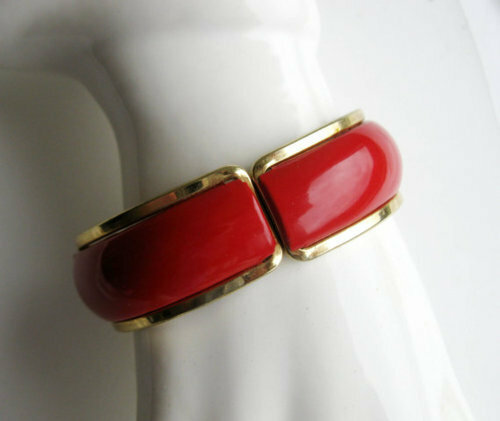 Vintage 1980s red enamel and gold metal clamper from popgoesmyvintage on etsy. $25. 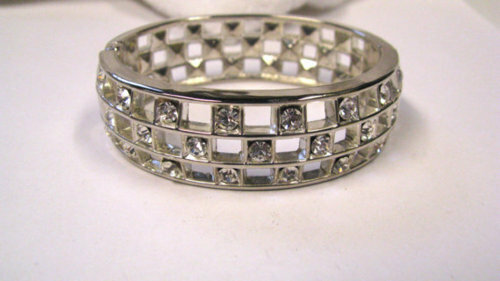 Vintage silver plated crystal rhinestone hinged bracelet from VermontJewelryShop on etsy. $22. Another one of my favorite vintage jewelry makers. 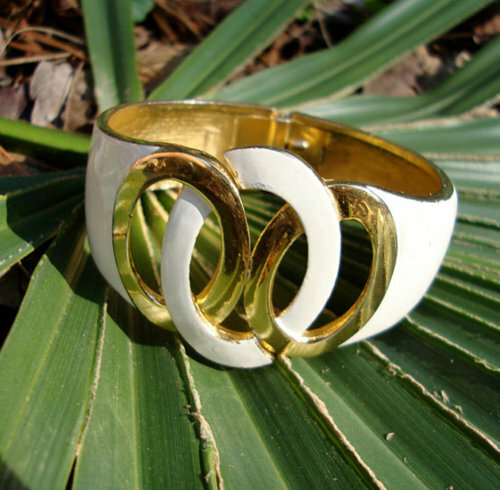 A vintage Trifari clamper in a creamy enamel and goldtone from GillyLynn on etsy. $18. 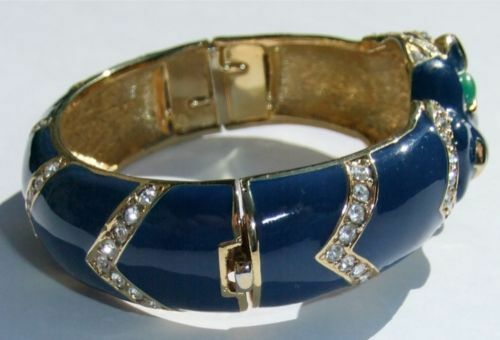 Vintage 1970s Givenchy lucite clamper bracelet. Current bid on eBay $74.99. 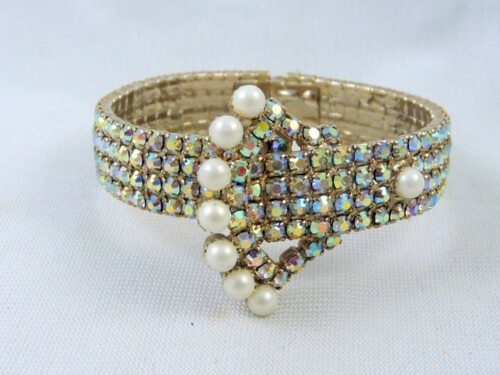 Vintage aurora borealis rhinestone and faux pearl buckle clamper. Current bid on eBay $34.95. 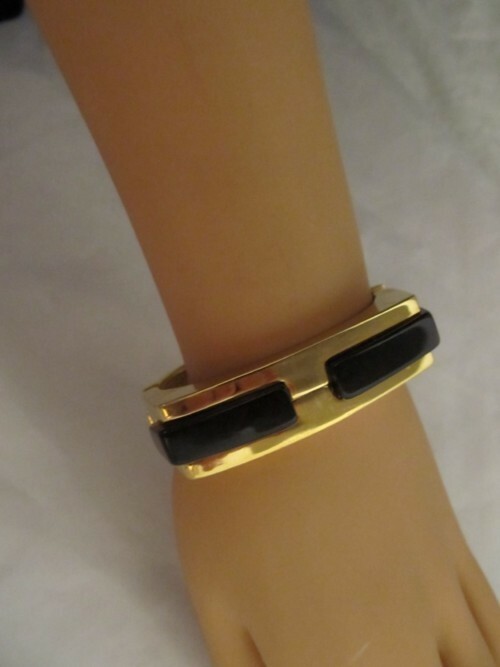 Vintage 1960s two-tone Lucite clamper bangles. This auction is for the blue one, but the seller has more. These are new old stock. Very mod. Current bid on eBay $20.72. 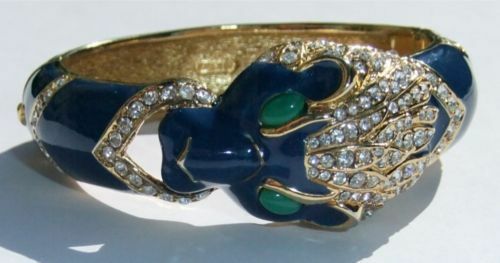 Vintage figural cat bracelet in blue enamel with rhinestones and glass eyes. Signed “Ciner.” Current bid on eBay $104.99. 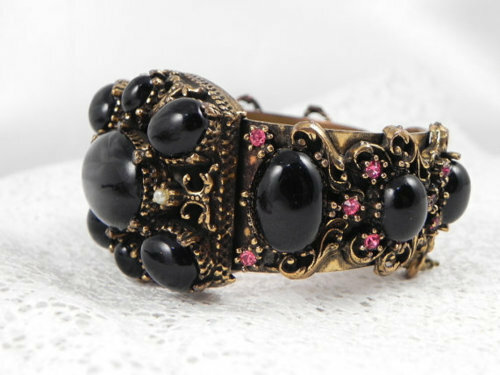 Vintage black Bakelite clamper with large rhinestones. Current bid on eBay $9.99. 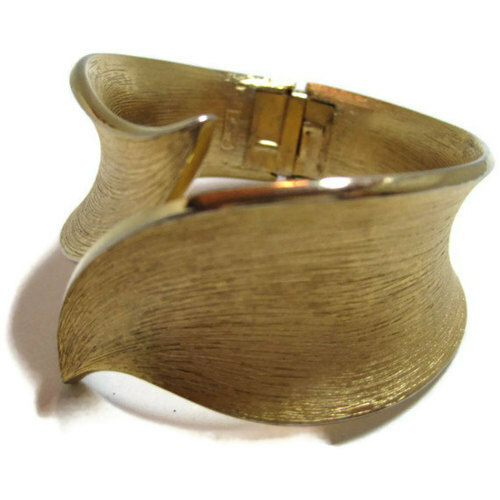 Vintage Trifari brushed gold leaf clamper from VintageGypsies on etsy. $32. 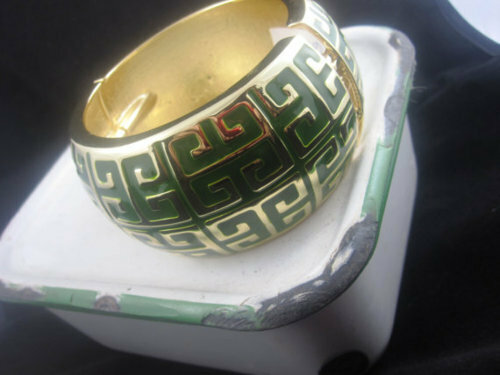 Very wide and striking green and goldtone clamper bangle from duSayeJewelry on etsy. $35. 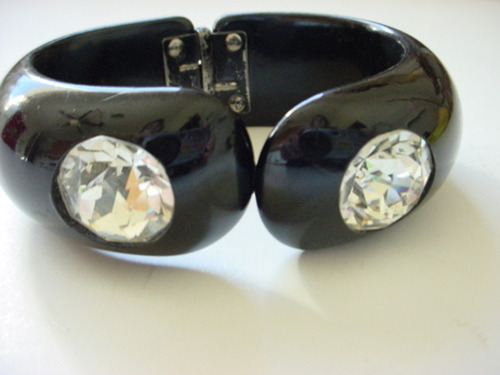 Vintage 1940s to 1950s thermoplastic with pave set rhinestones clamper bracelet and matching clip-on earrings. Signed by Weiss, highly collectible. Current bid on eBay $150. 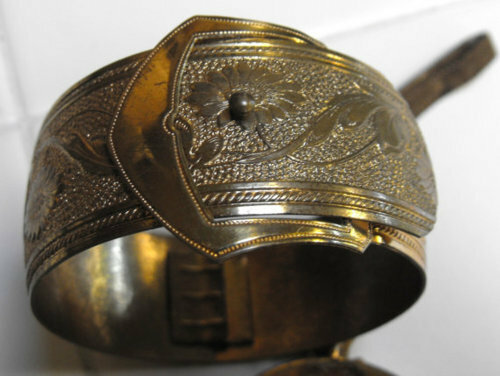 Vintage embossed brass buckle clamper from terrasouljewelry on etsy. $59. 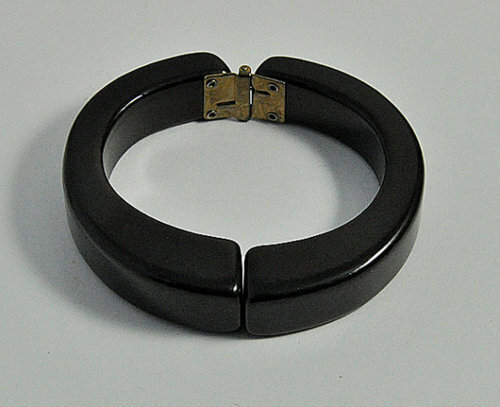 Vintage 1950s black Lucite clamper bangle from ANTIQUEANDVINTAGE on etsy. $24.97. Vintage goldtone clamper from EyeCandyAntiques on etsy. $18. Vintage chunky cabochon, multi-hinged, brass filigreed clamper from PattycakesPlunder on etsy. $65. Vintage modernist geometric design clamper from Moderra on etsy. $5. 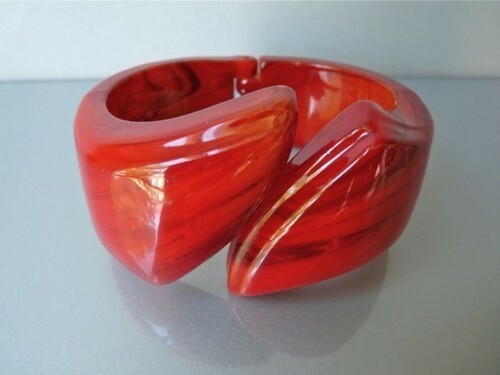 Vintage chunky and super shiny red orange clamper bracelet from mooivintage on etsy. $32.